Hooray for Comic-Con! I’m sure there’s quite the party going down in San Diego. I haven’t been following the news too closely, but all manner of comic book stories, super duper movies and a bunch of trailers have been released so far. But none of that excuses us from reading new comics this week! In honor of all the convention news, I read a whole buncha comics this week. I even went beyond Marvel and DC! We’ve got the new ongoing Faith series from Valiant, Power Rangers from BOOM! and Patsy Walker from Marvel! Sorry, that one always deserves a mention. Comic Book of the Week goes to Astonishing Ant-Man #10! It was a tough call between Ant-Man and Patsy Walker, but I picked fun action adventure over heartfelt emotional drama. That’s not usually my style, but sometimes Ant-Man deserves a win. Though Patsy Walker was really good, too. Curses! Now I’m starting to rethink everything! Comic Reviews: All-New Wolverine #10, Astonishing Ant-Man #10, Batman #3, Faith #1, Justice League #1, Mighty Morphin’ Power Rangers #5, Patsy Walker a.k.a. Hellcat #8, and Spider-Man #9. I was presented with an interesting conundrum from this week’s comic books, one that strikes to the very heart of the comic book market these days. Which was the better comic this week, Batman or Patsy Walker? Batman or Patsy Walker? I bet that’s a question I never thought I’d ask myself. We’ve got some very fun comics this week. 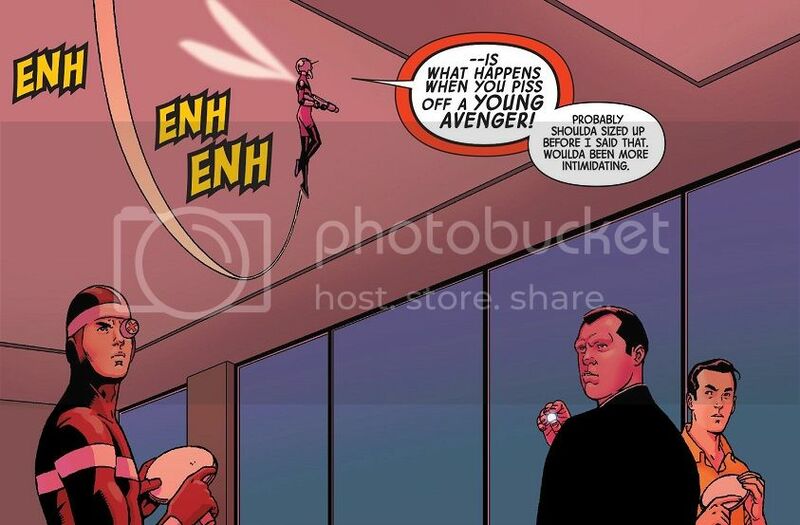 Astonishing Ant-Man goes full Ocean’s Eleven. Justice League tells a fun story about Robin’s first meeting with the team. And Civil War II assures us that it’s probably safe to ignore all of Marvel’s hype for this year. 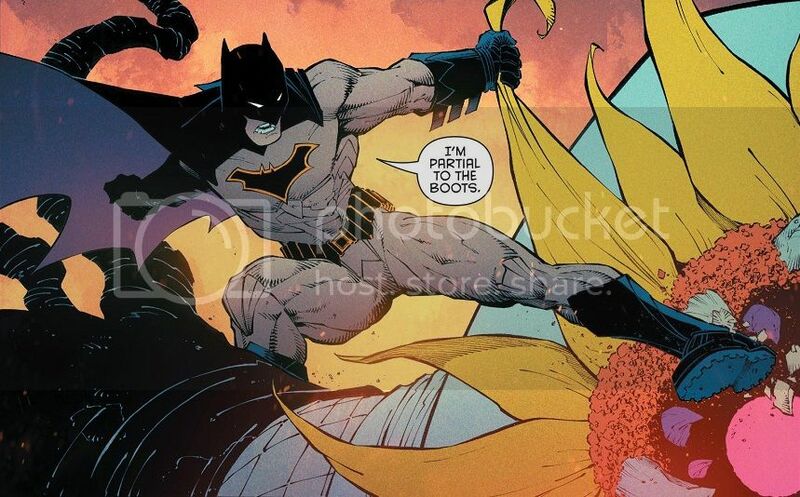 But the real battle comes down to an exciting, almost cinematic start for writer Tom King’s Batman run versus one of the most delightful issues of Patsy Walker a.k.a. Hellcat yet! Though it’s probably no surprise which issue wins Comic Book of the Week from me. I just can’t help myself. Greatness is greatness. Also, that’s Jessica Jones, for those of you wondering. 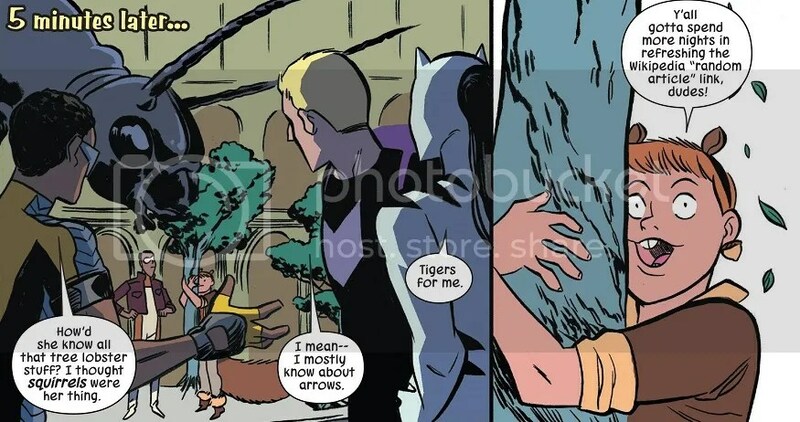 We can only hope they recreate this scene in Jessica Jones Season 2 on Netflix. Comic Reviews: Astonishing Ant-Man #9, Batman #1, Civil War II #2, Justice League #51 and Patsy Walker a.k.a. Hellcat #7. I’m a little late to the party, but I had a busy week and couldn’t get up a quick anything about all the comic book controversy. What have they done to Captain America?! What the heck have they done now to the DC Universe? Read on to get my reviews! Part of me was just planning to review the big two controversial issues and leave it at that. But this week also saw the release of some of my favorite comics, and quite honestly, each issue kind of serves as the anti-thesis of DC: Rebirth and the new Cap twist. So in an unprecedented move, Comic Book of the Week goes to three of my favorite comics, all of which released perfectly pleasing issues in this crazy week: Ms. Marvel, Unbeatable Squirrel Girl and Patsy Walker a.k.a. Hellcat. This week’s Hench-Sized Reviews is about as big a statement on comics as I may ever be able to make. I’m quite pleased with myself, and really enjoyed some of these reads. Comic Reviews: Captain America – Steve Rogers #1, DC Universe – Rebirth #1, Ms. Marvel #7, Patsy Walker a.k.a. Hellcat #6 and Unbeatable Squirrel Girl #8. Wowzers, what a week! Let me share with you just how insane this week was for me. First of all, it was the final week of my Kickstarter for Gamer Girl & Vixen, and we hit our fundraising goal on Wednesday! Hooray! Second of all, this was also the week I was moving into a new apartment, and that took several days. So there’s some exhaustion. And then this just happened to be the most insane week for comics in a long time! Not only did a new issue of Teen Titans come out, which I always give a big review. But this week saw new issues of Batman, Batgirl, Amazing Spider-Man, All-New Wolverine, Saga, Doctor Strange, Ms. Marvel, Patsy Walker, Grayson, We Are Robin, Unbeatable Squirrel Girl, Harley Quinn, Faith, and so many more! This would have been a wonderful week of reading, if I wasn’t so exhausted from moving and finishing up a Kickstarter. Fortunately, I did get to a couple of quality comics this week, so at least there’s that. This includes Comic Book of the Week for Ms. Marvel #6, for it’s lovely story of growing up superhero. Also, as a double reminder, my Kickstarter has blown past its fundraising goal this week! So the Gamer Girl & Vixen graphic novel is definitely getting made! If you want to snag a copy, head over to the Kickstarter! The campaign ends Monday morning. Comic Reviews: All-New Wolverine #7, Amazing Spider-Man #11, Batman #51, Doctor Strange #7, Ms. Marvel #6 and Patsy Walker a.k.a. Hellcat #5. So what did everybody think of Batman v. Superman: Dawn of Justice? Is the DC Cinematic Universe off to a good start? I will be seeing the movie tonight, and my review will go up early next week. I’m a little worried, since I didn’t care for Man of Steel. But I’m going to keep an open mind. Fortunately, comics were a blast this week! We’ve got new Patsy Walker, which is always a cause for celebration. As would be the new issue of Grayson, but unfortunately, something has gone horribly wrong! Read on to find out what. Comic Book of the Week goes to Batman #50, the big climax of Scott Snyder and Greg Capullo’s time on the title! The energy and excitement of this issue easily cast aside my various minor hang-ups with Snyder’s Batman. This is a solid, exciting issue. Speaking of solid, exciting issues, my new Kickstarter is only one week away! Next Saturday we will launch the next fundraising campaign for Gamer Girl & Vixen! I hope I can count on you henchies to lend your support and order my comic! And if you haven’t had a chance yet, you can read the entire first issue for free! You’re welcome to take my word for it that it’s good, but you can also see for yourself. Comic Reviews: Batman #50, Grayson #18, Harley Quinn #26, Patsy Walker a.k.a. Hellcat #4, Totally Awesome Hulk #4 and We Are Robin #10.